A high entropy alloy (HEA, CoCrFeNiMn) synthesized by mechanical alloying was used as the binder for the densification of WC by a pressureless high temperature procedure. Three different WC were used by modifying its microstructure with a high energy ball milling treatment. The alloy content in the HEA-WC mixture was varied from 10 to 30% vol. The microstructure and properties of the sintered composites were studied by X-ray diffraction, scanning electron microscopy and microindentation. 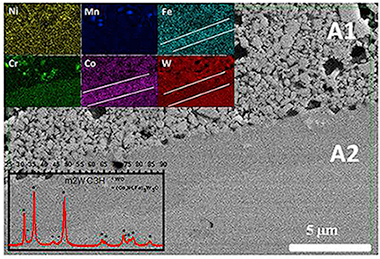 This work studies the structural evolution of TiNbxMn alloys (x: 0-12 wt%) synthetized by mechanical alloying in a planetary ball mill with different milling times between 1 h and 120 h. The specimens were characterized by X-ray diffraction patterns, scanning and transmission electron microscopies and Energy-dispersive X-ray spectroscopy. It was observed an evolution of the alloys developed from the raw Ti, Nb and Mn elements to bcc-TiNbxMn alloys and, finally, novel fcc-TiNbxMn alloys, with Fm3m space group symmetry, not previously observed. The presence of Mn promotes other interesting effects: a) the decreasing of the crystallite and the particle sizes, reaching values close to 4 nm and 400 nm, respectively, b) the partial amorphization of the fcc-TiNbxMn alloys due to the combined effect of the Mechanical Alloying and the difference of Mn atomic size in comparison with Ti and Nb and c) the presence of Mn that decreases the Fe amount (from milling media) in the as-milled powders. The synthesis of TiCxN1-x from Ti/C mixtures in a N-2 atmosphere performed in a high-energy planetary mill was used as example to study the influence of the use of additives in mechanically induced self-sustaining reaction (MSR) processes. 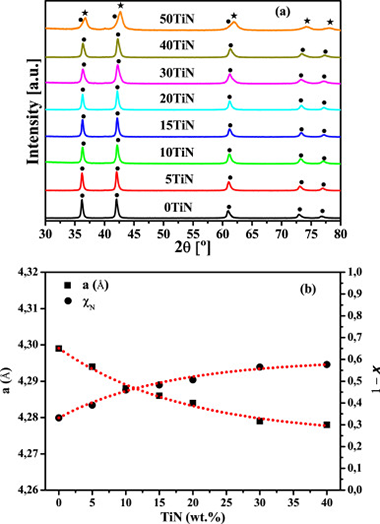 In particular, the effect of the addition of TiN, TiC, Si3N4 and SiC was analyzed. The self-sustaining reaction was extinguished when additive contents of 50, 40, 40 and 30 wt% for TiN, TiC, Si3N4 and SiC, respectively, were employed. These additives cannot be regarded as real inert since they served as an extra solid source for nitrogen and carbon, modifying the final stoichiometry of the TiCxN1-x phase. The adiabatic temperature (T-ad) determined for the mixtures with no MSR effect was well above the empirical limit value of 1800 K adopted as criterion for the occurrence of the self-propagating high-temperature synthesis (SHS) process. The ignition time (t(ig)) of the MSR process was practically invariant for low additive contents (approximately 50 min) and tended to increase up to maximum values of 85-95 min for the larger additive contents. Jaramillo-Páez, C., Sánchez-Fernández, F.J., Navío, J.A., Hidalgo, M.C. The properties of Nb2O5 strongly depend on its synthesis procedure as well as the conditions of ulterior thermal treatment. We report the synthesis of Nb2O5 powders prepared by sol-gel precipitation method using niobium(V) ethoxide as precursor. Two chemical routes were chosen: the presence of tryethyl amine (TEA) as precipitant/template agent, or the oxidant peroxide method. In addition, microwave-assisted activation was also used. The as-prepared samples by the above procedures were amorphous. Structural changes upon heating from room temperature up to 800 °C were investigated by X-ray powder diffraction technique combined with thermogravimetric analysis. 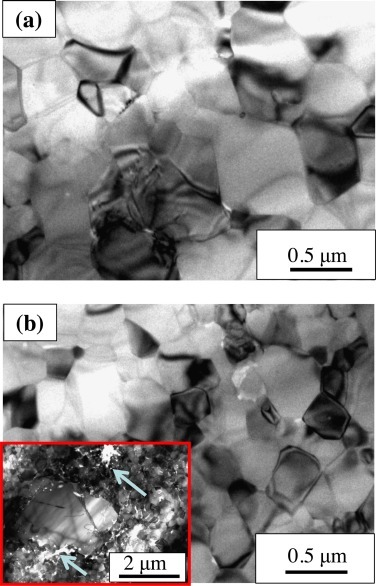 The sequential thermal treatment up to 800 °C promotes the crystallization of hexagonal phase to orthorhombic phase whereas the ulterior cooling to room temperature lead to a mixture of both phases. Samples calcined at selected temperatures of either 600 °C or 800 °C for 2 h, were characterized by XRD, SEM, N2-adsorption and diffuse reflectance spectroscopy (DRS). The synthetic approach routes as well as the combined microwave activation followed by ulterior thermal treatment lead to changes not only on particle size but also on the textural properties of the synthesized catalysts. The catalysts synthesized have been evaluated using Rhodamine B (RhB) as a substrate, under both UV and visible lighting conditions. None of the catalysts synthesized showed activity in the visible. 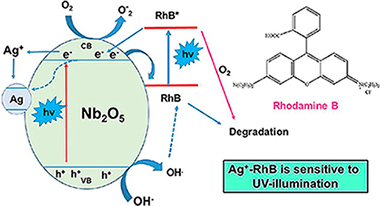 Under UV-illumination conditions, some of the catalysts exhibited a relatively low photoactivity in the degradation of RhB, which is associated with a photo-sensitizing effect. However, the addition of Ag+ ions considerably increased the activity of all the catalysts in the degradation of RhB under UV-illumination conditions. A mechanism is proposed to explain the photo-induced processes obtained, leaving the door open to the possible implications of the observed results in relation to the interaction of RhB dye with noble metal nanoparticles such as silver. Murcia, J.J., Hernández-Laverde, M., Rojas, Muñoz, E., Navío, J.A., Hidalgo, M.C. The aim of the present work was to evaluate the effectiveness of flocculation-photocatalysis as combined processes in the treatment of dairy industries wastewater. Different commercial and lab prepared flocculants and photocatalysts were evaluated. All the materials prepared were extensively characterized. Commercial materials presented the best physicochemical properties and performance in the treatment of the studied wastewater. On one hand, all the photocatalysts evaluated showed bactericidal activity for E. Coli, total coliforms and other enterobacteriaceae. Total elimination of E. coli was obtained by using commercial TiO2 P25 Evonik, under 120 W/m2 of UV–vis light intensity and 5 h of total illumination time. Other species of bacteria remained after treatment under these conditions. It was also found that the highest light intensity of 120 W/m2 led to increase the Chemical Oxygen Demand and Total Organic Carbon in the samples treated, it can be due to the faster formation of new organic compounds as intermediaries during the photocatalytic reactions at the highest photonic flux. Flocculation pre-treatment of the wastewater samples led to improve the effectiveness of the photocatalytic treatment; thus, the combination of flocculation-photocatalysis treatments at low light intensity of 30 W/m2 leads to achieve the total elimination of E. coli, and under this intensity the elimination of total coliforms and other enterobacteriaceae increased 5.48% compared to the photocatalytic treatment alone. These treatment conditions led to comply the Colombian regulations for dairy wastewater. (1) Background: The use of physical barriers to prevent the invasion of gingival and connective tissue cells into bone cavities during the healing process is called guided bone regeneration. The objective of this in-vitro study was to compare the growth of human osteoblasts on Poly(Lactic-co-Glycolic) (PLGA) membranes modified with oxygen plasma and Hydroxyapatite (HA), silicon dioxide (SiO2), and titanium dioxide (TiO2) composite nanoparticles, respectively. (2) Methods: All the membranes received a common treatment with oxygen plasma and were subsequently treated with HA nanostructured coatings (n = 10), SiO2 (n = 10) and TiO2 (n = 10), respectively and a PLGA control membrane (n = 10). The assays were performed using the human osteoblast line MG-63 acquired from the Center for Scientific Instrumentation (CIC) from the University of Granada. The cell adhesion and the viability of the osteoblasts were analyzed by means of light-field microphotographs of each condition with the inverted microscope Axio Observer A1 (Carl Zeiss). For the determination of the mitochondrial energy balance, the MitoProbe (TM) JC-1 Assay Kit was employed. For the determination of cell growth and the morphology of adherent osteoblasts, two techniques were employed: staining with phalloidin-TRITC and staining with DAPI. (3) Results: The modified membranes that show osteoblasts with a morphology more similar to the control osteoblasts follow the order: PLGA/PO2/HA > PLGA/PO2/SiO2 > PLGA/PO2/TiO2 > PLGA (p < 0.05). When analysing the cell viability, a higher percentage of viable cells bound to the membranes was observed as follows: PLGA/PO2/SiO2 > PLGA/PO2/HA > PLGA/PO2/TiO2 > PLGA (p < 0.05), with a better energy balance of the cells adhered to the membranes PLGA/PO2/HA and PLGA/PO2/SiO2. (4) Conclusion: The membrane in which osteoblasts show characteristics more similar to the control osteoblasts is the PLGA/PO2/HA, followed by the PLGA/PO2/SiO2. Thermal analysis of some sericite clays, from several deposits in Spain, which are not exploited at this time, has been studied. The samples have been previously characterized by mineralogical and chemical analysis. Sericite clays have interesting properties, with implications in ceramics and advanced materials, in particular concerning the formation of mullite by heating. According to this investigation by differential thermal and thermogravimetric analysis (DTA-TG), the sericite clay samples can be classified as: Group (I), sericite-kaolinite clays, with high or medium sericite content, characterized by an endothermic DTA peak of dehydroxylation of kaolinite with mass loss, which overlapped with dehydroxylation of sericite, and Group (II), sericite-kaolinite-pyrophyllite clays, with broader endothermic DTA peaks, in which kaolinite is dehydroxylated first and later sericite and pyrophyllite with the main mass loss, appearing the peaks overlapped. X-ray diffraction analysis of the heated sericite clay samples evidenced the decomposition of dehydroxylated sericite and its disappearance at 1050 A degrees C, with formation of mullite, the progressive disappearance of quartz and the formation of amorphous glassy phase. The vitrification temperature is similar to 1250 A degrees C in all these samples, with slight variations in the temperatures of maximum apparent density (2.41-2.52 g mL(-1)) in the range 1200-1300 A degrees C. The fine-grained sericite content and the presence of some mineralogical components contribute to the formation of mullite and the increase in the glassy phase by heating. Mullite is the only crystalline phase detected at 1400 A degrees C with good crystallinity. SEM revealed the dense network of rod-shaped and elongated needle-like mullite crystals in the thermally treated samples. These characteristics are advantageous when sericite clays are applied as ceramic raw materials. It is with the profoundest regret that we must report the passing of Prof. José Manuel Criado on February 27, 2018 at the age of 73. We express our most sincere condolences to his family, colleagues and friends. Prof. Criado was born in Sevilla, Spain, on June 13th, 1944. He studied chemistry at the University of Seville and recieved his PhD from the same university under the supervision of Prof. Francisco González García and Prof. José María Trillo. He held a position as assistant professor at the Department of Inorganic Chemistry of the University of Seville from 1968 until 1972. Then, he joined the Consejo Superior de Investigaciones Científicas (CSIC) or National Research Council of Spain. In this institution he was junior researcher, senior researcher and, from 1986, full professor. Moreover, he has been visiting professor in a number of international institutions such as Stanford University (USA), CNRS Thermodynamics and Microcalorimetry Center in Marseille (France), University of Salford (UK), Macaulay Research Institute (UK), Institute of Inorganic Chemistry (Czech Republic), University of Chile (Chile). He had long-lasting collaborations with scientists from all over the world and visited labs in many countries. For many years, he used to spend some weeks abroad in the frame of collaboration projects with a number of international research groups, of special importance where his projects with the Czech Republic or Chile that lasted for over 20 years. He also served as an editorial board member of Thermochimica Acta for a long time and contributed largely to the further development of our academic field. First research works of Prof. Criado were done within the field of heterogeneous catalysis, but very soon, he got interested in reactivity of solids and thermal analysis. Thus, most of his scientific career has been devoted to the study of kinetics of solid-state processes and mechanochemisty. He published about 240 papers in international journals. In the field of kinetics of solid-state processes, he made significant contributions, such as showing the limitations of using single linear heating rate experiments for extracting kinetic parameters, the proposal of master curves for discerning the kinetic model followed by the process or the combined analysis of experimental data obtained under different heating schedules. Moreover, after learning about the sample controlled thermal analysis (SCTA) method directly from Prof. Rouquerol in Marseille (France) and Profs. Paulik brothers in Budapest (Hungary), he constructed several of these instruments and extended the use of SCTA to the kinetic analysis of heterogeneous reactions, highlighting its advantages over conventional heating. Additionally, he used the kinetic control of solid-state processes by SCTA for the preparation of a number of functional and structural materials with controlled microstructures and properties. In the field of mechanochemistry, he made substantial contributions to the preparation of materials by gas–solid reaction using high energy planetary ball mills specially modified by him to work under controlled gas atmosphere. Probably, the main contribution of Prof. Criado as a scientist has been as teacher and mentor for many of us. Despite of spending most of his scientific career in a research center rather than in a university, his laboratories were always full of students, postdocs and visitors from all over the world. He devoted a great effort to motivate and stimulate young people to pursue a career in science. His enthusiasm for science was sincere, as he loved science and research. Thus, he worked until the very last days and, even, when he could not go to the institute because he did not feel well, he worked in a small lab at home. He was very generous and always shared his knowledge with others. Thus, he expended long hours teaching about kinetics, making the complex equations easy to understand. Only those with a deep knowledge have this ability! It is not rare that many of his former students, postdocs and coworkers have permanent positions as professors and scientist in a number of international institutions. Another significant feature of Prof. Criado was his hospitality. He and his wife Maria Jesús Dianez, who joined his research group few years ago, has always his home doors open to any coworker or visitor. We will all miss him not only as a scientist with a deep knowledge but as a friend we loved so much. In this work, (scanning) transmission electron microscopy has been used to study the nanostructure of porous cobalt coatings obtained by magnetron sputtering using helium as process gas. This nanostructure consists of closed pores of different nanometric size (about 4-20 nm) that are distributed all over a nanocrystalline Co matrix and filled with the deposition gas. Spatially resolved electron energy-loss spectroscopy analysis was applied to measure and map, with high lateral resolution, the relevant physical properties (density, pressure and He-K edge shift) of helium trapped inside these individual nanopores, in order to provide new insights about the growth mechanism involved in such systems. In particular, a coefficient of proportionality, C = 0.039 eV nm(3), between the blue shift of the He K-edge and the He density has been found. In addition, very high He densities (10-100 at./nm(3)) and pressures in the gigapascal range (0.05-5.0 GPa) have been measured. The linear dependence of these parameters as a function of the inverse radii obeying to the Laplace-Young law for most of the pores suggests that their formation during the coating's growth takes place in regime of elastic deformation of the Co matrix. Silica nanoparticles are attractive carriers due to their improved safety and effectiveness in drug delivery. 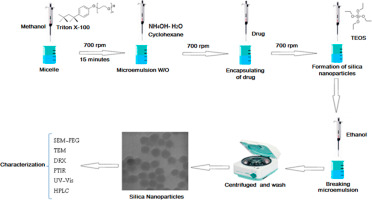 Silica nanoparticles were synthesized by using microemulsion assisted sol-gel method, and a model anticancer drug 5-fluorouracil (5-FU) was added to the silica precursor before hydrolysis and condensation reactions start. The obtained materials were characterized by Transmission Electron Microscopy (TEM) and Fourier Transform Infrared Spectroscopy (FTIR). Drug encapsulation within silica nanoparticles causes an increase in particle size. However, particle morphology is not affected. The drug release profile was obtained through high performance liquid chromatography (HPLC). The encapsulation approach showed to be effective for sustaining a continuous and increasing release during testing time (98 h). 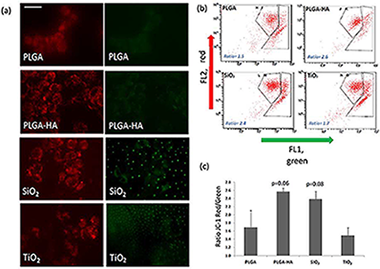 Further studies were performed to evaluate the cytotoxic effects of silica nanoparticles with loaded 5-FU on Chinese hamster ovary cells (CHO-K1). Materials are non-cytotoxic for all concentration tested (5-200 mu g/mL). Mixed powders of Bi2O3 and Fe2O3 are shown to yield single-phase, dense nanostructured polycrystals of BiFeO3 in reaction flash sintering experiments, carried out by applying a field of 50 V cm(-1) and with the current limit set to 35 mA mm(-2). The furnace was heated at a constant rate with the reaction sintering taking place abruptly upon reaching 625 degrees C. Remarkably, an intermediate bismuth-rich phase of the oxide that forms just before reaching the flash temperature transforms, and at the same time sinters, into singlephase BiFeO3 within a few seconds after the onset of the flash. The BiFeO3 so produced is electrically insulating, a property that is critical to its applications. This one-step synthesis of single-phase polycrystals of complex oxides from their basic constituents, by reaction flash sintering, is a significant development in the processing of complex oxides, which are normally difficult to sinter by conventional methods. Tailoring the interaction of electromagnetic radiation with matter is central to the development of optoelectronic devices. This becomes particularly relevant for a new generation of devices offering the possibility of solution processing with competitive efficiencies as well as new functionalities. These devices, containing novel materials such as inorganic colloidal quantum dots or hybrid organic-inorganic lead halide perovskites, commonly demand thin (tens of nanometers) active layers in order to perform optimally and thus maximizing the way electromagnetic radiation interacts with these layers is essential. 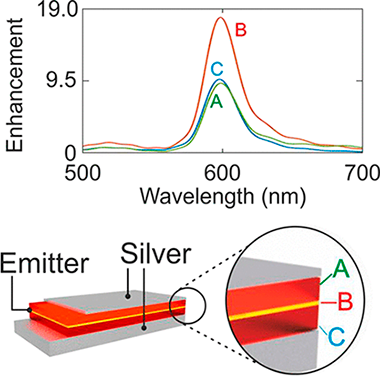 In this Perspective, we discuss the relevance of tailoring the optical environment of the active layer in an optoelectronic device and illustrate it with two real-world systems comprising photovoltaic cells and light emitting devices. A compromise between high power conversion efficiency and long-term stability of hybrid organic inorganic metal halide perovskite solar cells is necessary for their outdoor photovoltaic application and commercialization. Herein, a method to improve the stability of perovskite solar cells under water and moisture exposure consisting of the encapsulation of the cell with an ultrathin plasma polymer is reported. The deposition of the polymer is carried out at room temperature by the remote plasma vacuum deposition of adamantane powder. This encapsulation method does not affect the photovoltaic performance of the tested devices and is virtually compatible with any device configuration independent of the chemical composition. 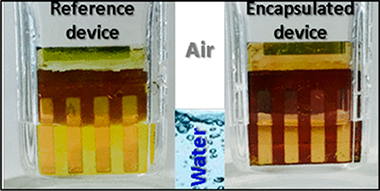 After 30 days under ambient conditions with a relative humidity (RH) in the range of 35-60%, the absorbance of encapsulated perovskite films remains practically unaltered. The deterioration in the photovoltaic performance of the corresponding encapsulated devices also becomes significantly delayed with respect to devices without encapsulation when vented continuously with very humid air (RH > 85%). More impressively, when encapsulated solar devices were immersed in liquid water, the photovoltaic performance was not affected at least within the first 60 s. In fact, it has been possible to measure the power conversion efficiency of encapsulated devices under operation in water. The proposed method opens up a new promising strategy to develop stable photovoltaic and photocatalytic perovskite devices. In this work, energy storage properties of mixed copper oxide wrapped by reduced graphene oxide and nitrogen-doped reduced graphene oxide were investigated. 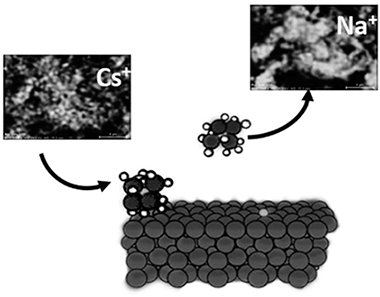 First, co-electrophoretic deposition technique was used to coat GO@CuO on nickel foam; followed by electrochemical phase transformation to rGO@CuxO. Electron spectroscopy analyses (XPS, REELS and UPS) confirm the phase transformation and electrochemical reduction. 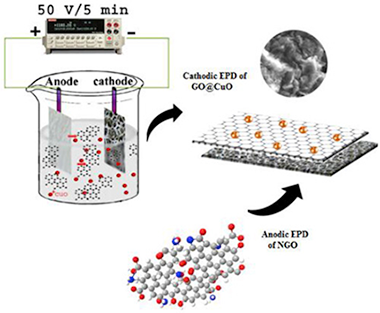 Then, an electrophoretic deposition was carried out for coating nitrogen-doped graphene oxide on nickel foam coupled to its electrochemical reduction to the NrGO. 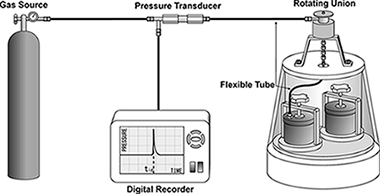 The cathode and anode performances were studied by galvanostatic charge-discharge, cyclic voltammetry and impedance spectroscopy. The rGO@CuxO and NrGO exhibit a favorable specific capacity of 267.2 and 332.6 C g(-1) at 2 A g(-1), respectively. High electrochemical activity and elimination of polymer binders with a maximum potential of 1.6 V are among the advantages of rGO@CuxO//NrGO electrochemical charge storage device. Furthermore, fabricated device provided a maximum specific power and specific energy of 11917.24 W kg(-1) and 14.15 Wh kg(-1), respectively, with 86% capacity retention after 2000 cycles. Is an alumina-whisker-reinforced alumina composite the most efficient choice for an oxidation-resistant high-temperature ceramic? The search of a competitive ceramic material for structural applications demands several requisites: a simple microstructure with easy reproducibility, good intrinsic mechanical properties and most of all, an optimal oxidation resistance. This later point is a challenging point for most ultrahigh refractory materials. In this work an alumina (Al2O3) whisker-reinforced Al2O3 composite prepared by spark plasma sintering (SPS) is studied. It will be shown that, although the microstructure is quite similar to that of pure monolithic one, there is a notorious enhancement of the high-temperature deformation resistance, reaching up to one order of magnitude over the pure Al2O3 specimen. On the other hand, the activation energy of these composites increases notably. The results are explained in terms of an original model. A comparison with reported data shows that such composite is as efficient as a SiC-whisker-reinforced Al2O3 composite, with the advantage of its oxidation resistance and much less fabrication cost. Spark plasma sintering of titanium nitride in nitrogen: Does it affect the sinterability and the mechanical properties? Titanium nitride ceramics have an intrinsic interest due to its optical and structural applications. However, the conditions for sintering of dense pieces are not still clarified. 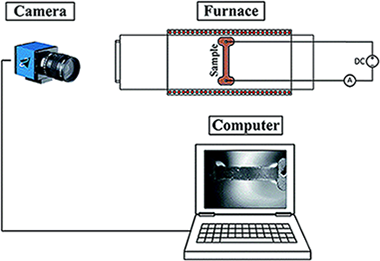 This research work is focused on the spark plasma sintering (SPS) of near-fully dense fine-grained TiN. The main goal is giving a response to a longstanding debate: can the external atmosphere favor sintering? Different sintering atmospheres, either vacuum or a nitrogen flow, have been used during SPS heating to this purpose. X ray diffraction analysis has showed the presence of TiN as the main phase with traces of Ti4O7 in optimal SPS conditions (1600 °C, one minute dwell time). Our results show that the use of a nitrogen flow while heating can improve sinterability very slightly, but mechanical properties are essentially unaltered within the experimental uncertainty. The hardness reaches values as high as 20GPa whereas fracture toughness can be evaluated around 4 MPam1/2. It is reported the synthesis of CaCO3 vaterite as stable nanoparticles and submicron-sized by a simple and relatively rapid procedure. XRD, SEM and FTIR techniques have been used to characterize the precipitated products. The synthesis is based on chemical precipitation of inorganic salt precursors, calcium nitrate tetra hydrate and sodium bicarbonate, and using the disaccharide sucrose as an additive in aqueous medium. The role of the disaccharide sucrose is to control the vaterite precipitation after nucleation and growth. It has been found that an increase in sugar concentration promotes the crystal precipitation of vaterite with spherulitic morphology, as revealed by SEM, and changed the surface of the precipitated particles. There is a significant difference between CaCO3 precipitation in the absence and presence of sucrose. Addition of 0% of sucrose leads to 83% of calcite as identified by XRD methods. In contrast, addition of 67% of sucrose in aqueous medium produces 100% vaterite. The present results may be useful to provide a quick, simple, inexpensive and novel method for the controlled synthesis of new advanced biomaterials based on vaterite particles without hazardous chemicals and inert atmosphere, with great possibilities for industrial scale production. A mechanically induced self-sustaining reaction (MSR) was used to synthesize hafnium diboride nanoparticles. Along this route, magnesium was selected as a robust reducing agent for co-reduction in boron and hafnium oxides in a combustive manner. Combustion occurred after a short milling period of 12 minutes. The hafnium diboride nanoparticles had a polygonal faceted morphology and were 50-250 nm in diameter. The assessment of the processing mechanism revealed that the initial combustive reduction in B2O3 to elemental B by Mg was the major step for progressing the overall reaction. After that, HfO2 can be reduced to elemental Hf, followed by the synthesis of HfB2 phase. Jaramillo-Páez, C.; Navío, J.C.; Hidalgo, M.C. ZnO nanoparticles were successfully synthesized by a controlled precipitation procedure by mixing aqueous solutions of Zn(II) acetate and dissolved Na2CO3 at pH ca. 7.0 without template addition and ulterior calcination at 400 °C for 2 h. The Ag-ZnO catalysts (ranging from 0.5 to 10 Ag wt.-%) were obtained by photochemical deposition method at the surface of the prepared ZnO sample, using AgNO3 as precursor. 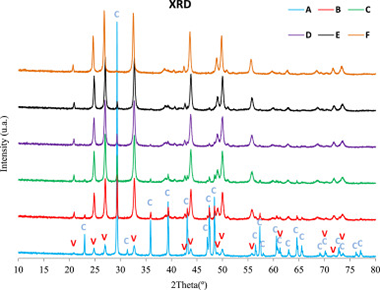 The as-prepared catalysts (with and without silver) were characterized by XRD, BET, FE-SEM, TEM, and XPS and diffuse reflectance spectroscopy (DRS). The effect of Ag-phodeposition on the photocatalytic properties of ZnO nanoparticles was investigated. Three different probe molecules were used to evaluate the photocatalytic properties under UV-illumination and visible illumination: Methyl Orange and Rhodamine B were chosen as hazardous dyes and Phenol as a transparent substrate. For each of the chosen substrates, it was observed that the UV-photocatalytic properties of ZnO improved with the amount of Ag deposited, up to an optimum percentage around 1–5 wt.-% Ag, being even better than the commercial Evonik-TiO2(P25) in the same conditions. Above this amount, the UV-photocatalytic properties of the Ag-ZnO samples remain unchanged, indicating a maximum for Ag-deposition. While ZnO and Ag-ZnO catalysts can photodegrade Rhodamine B, Methyl Orange and Phenol totally within 60 min under UV-illumination, the process is slightly faster for the case of Ag–ZnO nanoparticles. Under Vis-illumination, the silver-metalized samples did not present photocatalytic activity in the degradation of Methyl Orange. However, a very low photoactivity was present for phenol degradation (10% conversion) and a moderate conversion of ca. 70% for Rhodamine B degradation, after 120 min of Visible-illumination. 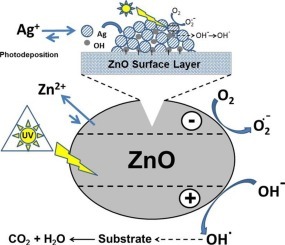 High conversion values and a total organic carbon (TOC) removal of 86–97% were obtained over the Ag-ZnO photocatalysts after 120 min of UV-illumination, suggesting that these Ag-modified ZnO nanoparticles may have good applications in wastewater treatment, due to its reuse properties. The potential use of a new family of synthetic swelling micas for cesium immobilization from aqueous solution was evaluated and the structural modifications after adsorption were analyzed. The results have revealed that they are good cesium adsorbents compared to natural clays and as the layer charge increases, the adsorption capacity and affinity increase. The cesium ions are adsorbed through a cation exchange mechanism, but an inner sphere complex with the basal O atoms of the tetrahedral sheet is favored. These findings imply that is possible to design minerals with improved environmental applications.